I’ve been involved with World Mail Panel surveys since March of this year, and the money I earn from them (about $15 a month) has gone into the stuff I write about and love – notebooks, pens, ink, stationery, etc. 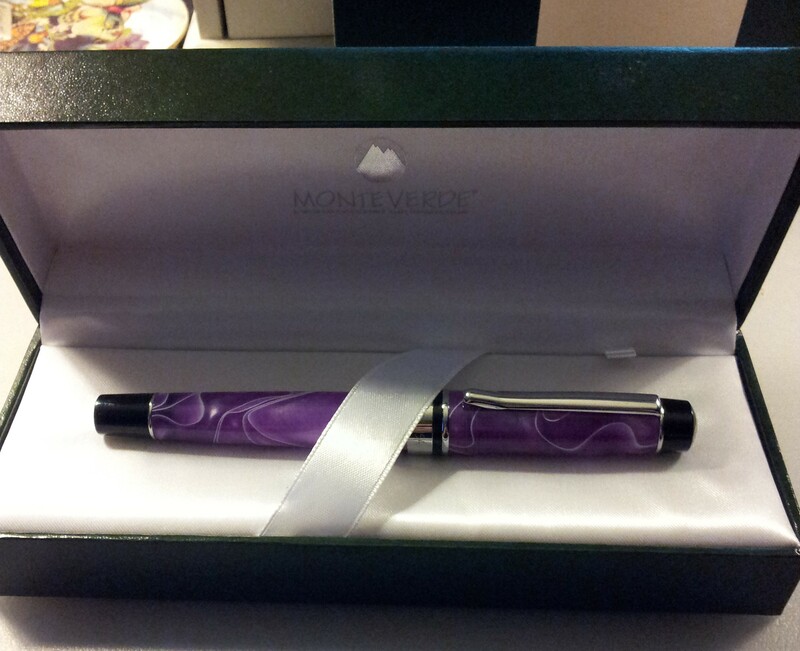 Recently I spent my earnings on a special order through Wonderpens: the Monteverde Prima fountain pen with a 1.1 stub nib, in Purple Swirl. 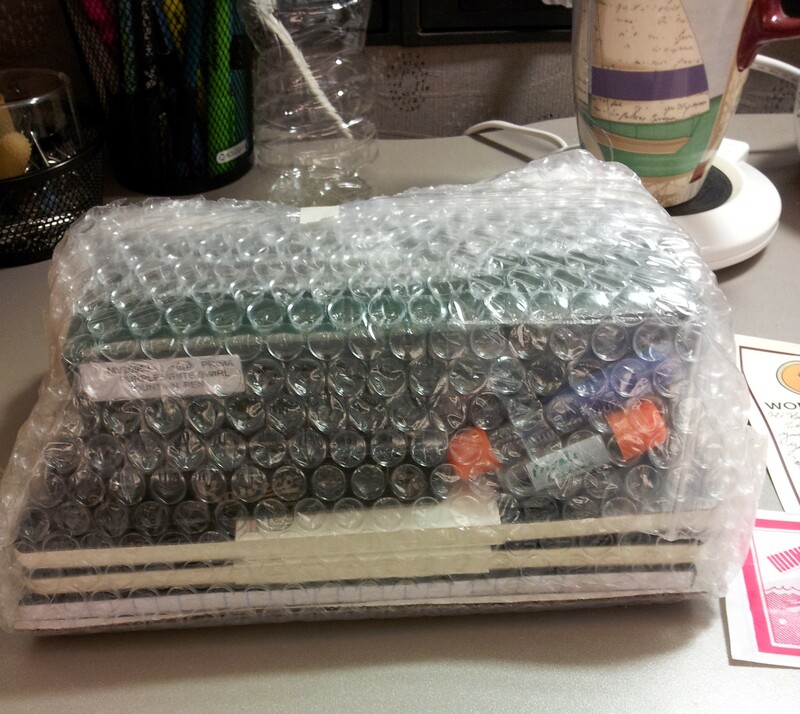 And on Thursday last the pen arrived, along with a few other goodies. 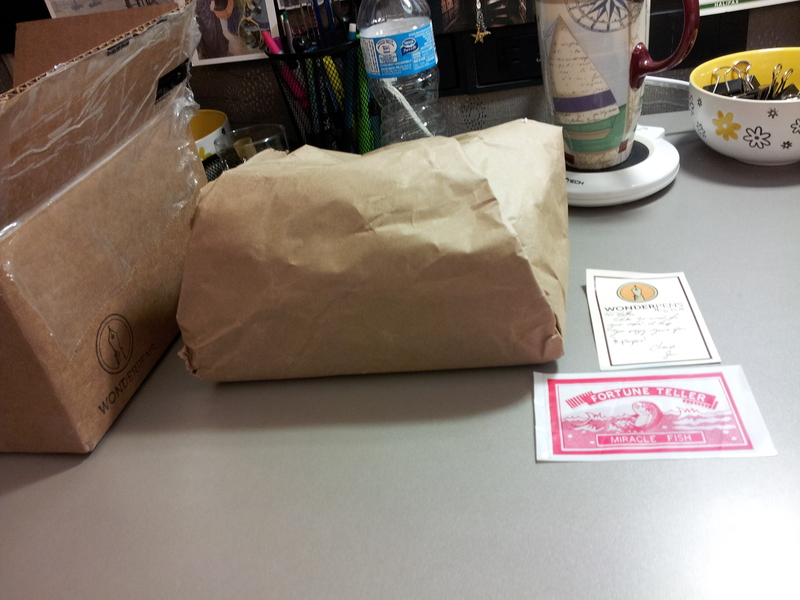 Amazing packaging – it was like breaking into a safe to remove all the paper and tape. Nothing moved on the trip from Toronto to Calgary that’s for sure. 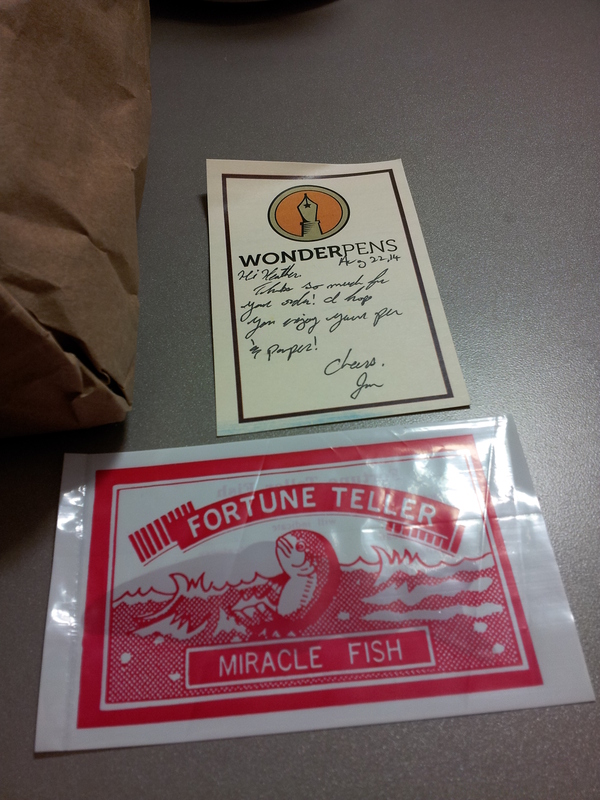 The great folks at Wonderpens always include a note saying thank you for the order, and a Fortune Teller fish which intrigued my co-workers! They also wrote thank you on the bottom of my invoice. Monteverde Prima, Kaweco Sport Ink Roller – Demonstrator, two Leuchtturm notebooks, Rhodia notepad and two ink samples. 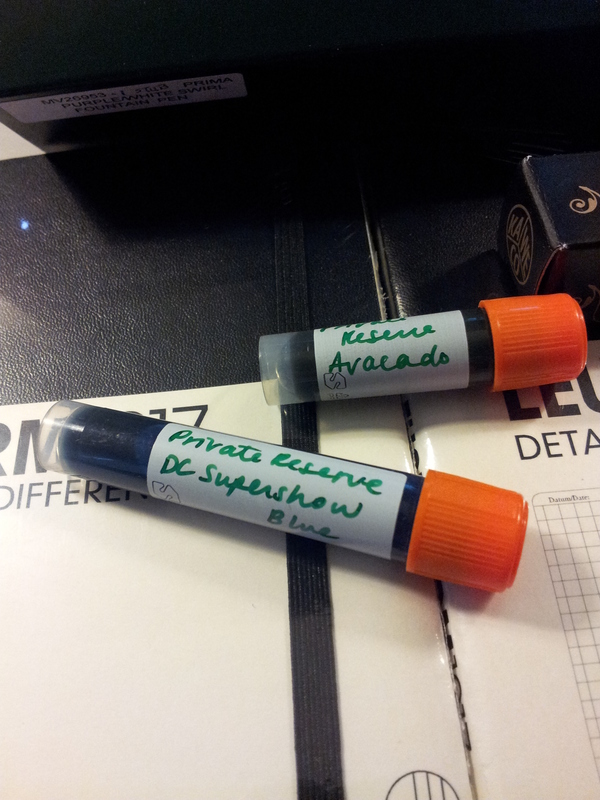 So I ordered ink samples of DC Supershow Blue and Avacado (sic) from Private Reserve. Both colours are really bright. 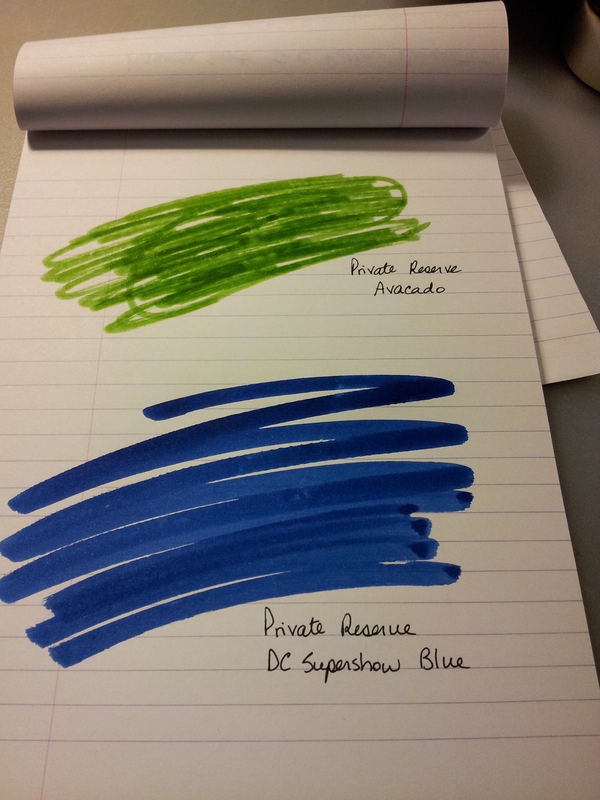 I haven’t inked up any pens with either of these inks but I was still able to do an ink swab. On to the notebooks: two Leuchtturm large softcovers, one lined, one grid. 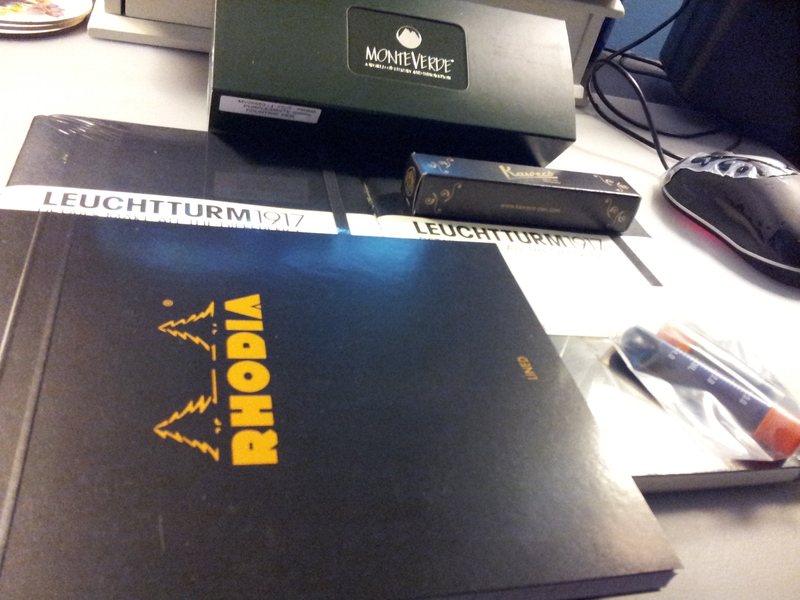 And one black Rhodia notepad in Black, lined, as my present one is getting low. Next up is the Kaweco Sport Ink Roller – Demonstrator. 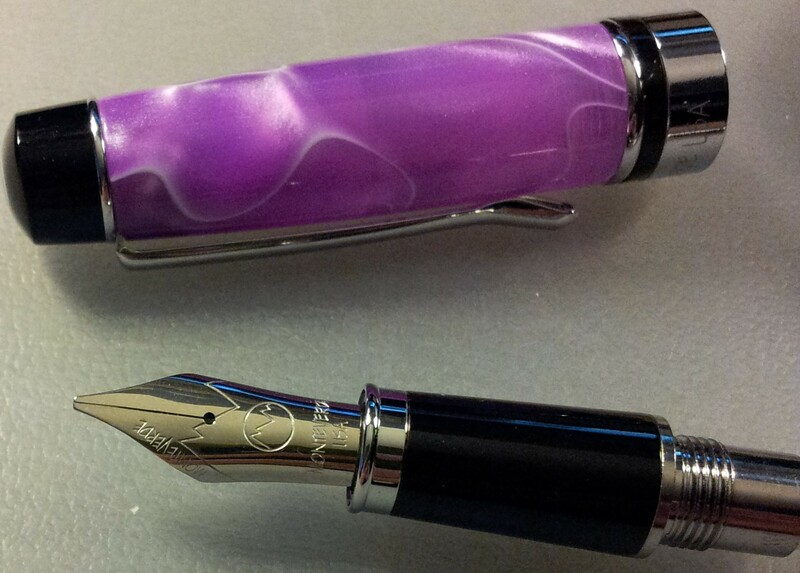 Yes it’s true: this is not a fountain pen. It is a rollerball. 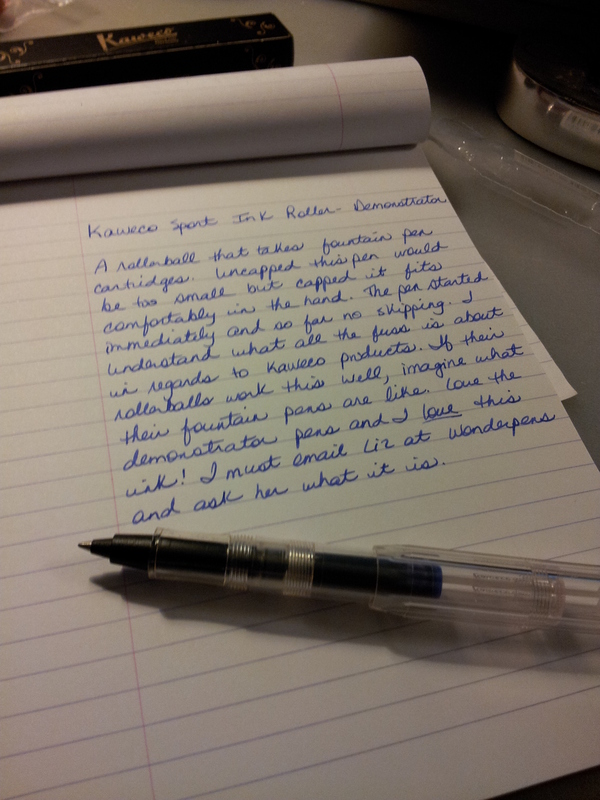 I wanted another rollerball that took fountain pen ink cartridges; the Kaweco is much finer than the Online rollerball I purchased earlier this year. 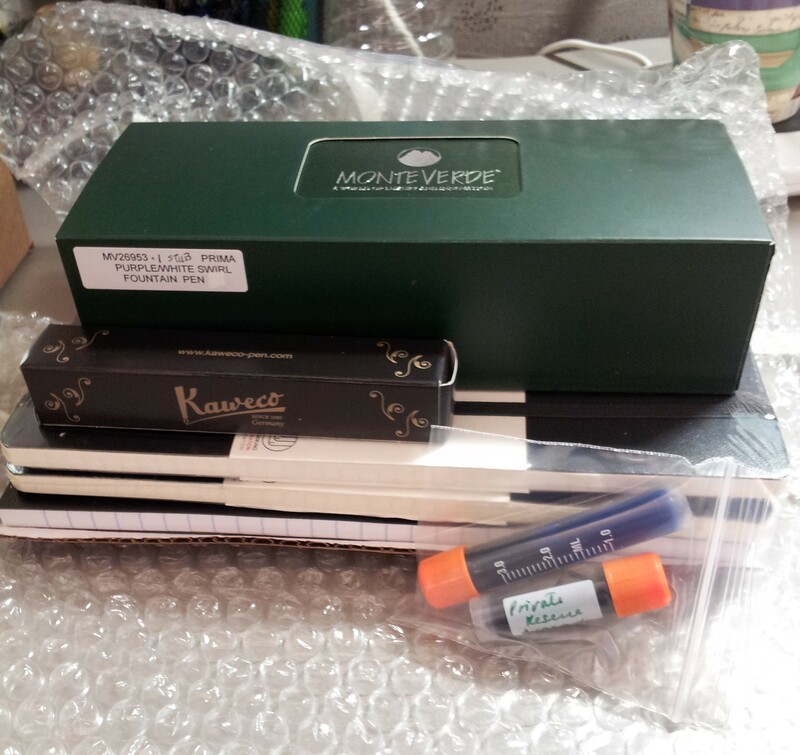 I find the Kaweco packaging very appealing; it has a vintage feel. Kaweco is a German company; I always thought they were Japanese for some reason. It’s quite a small pen but when posted it’s comfortable in the hand. 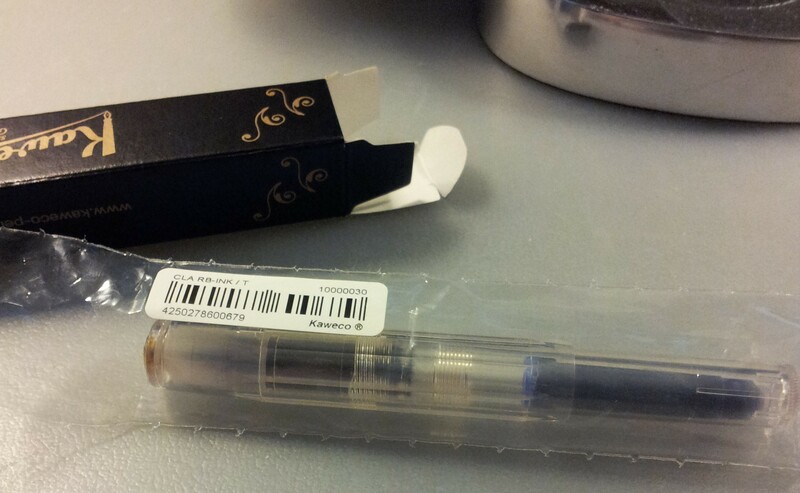 The pen came with one ink cartridge whose ink I love; I will have to ask John and Liz (Wonderpens) the name of it. The cartridge snapped in very easily and the pen started up right away, with no skipping so far. Great writer; very smooth. I understand why people rave about Kaweco products; if their rollerballs are this amazing I’m sure their fountain pens will not disappoint. Below is a writing sample on my Rhodia pad (my old one). Another thing I love about this rollerball is the Demonstrator quality; I really enjoy being able to see the ink cartridge. You can see the colour and how much ink is left. And now for the star of the show…. 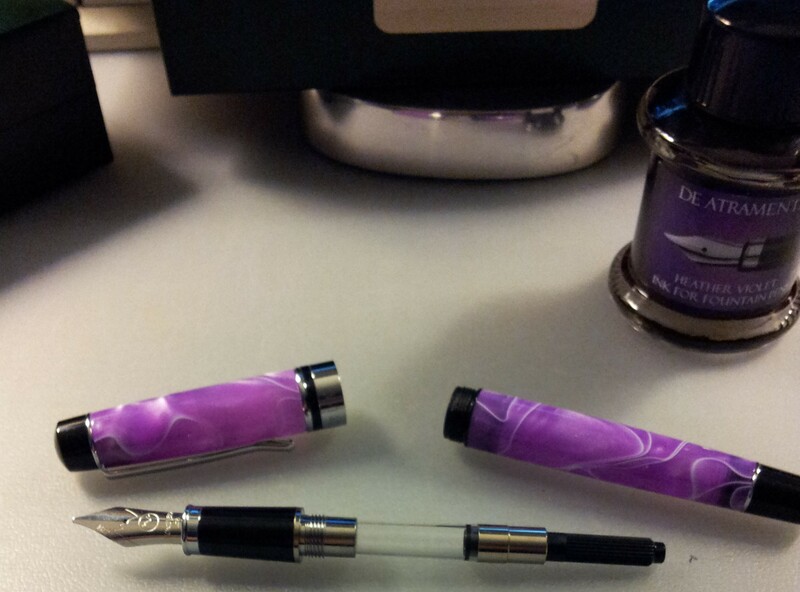 Here she is, the Prima in Purple Swirl. 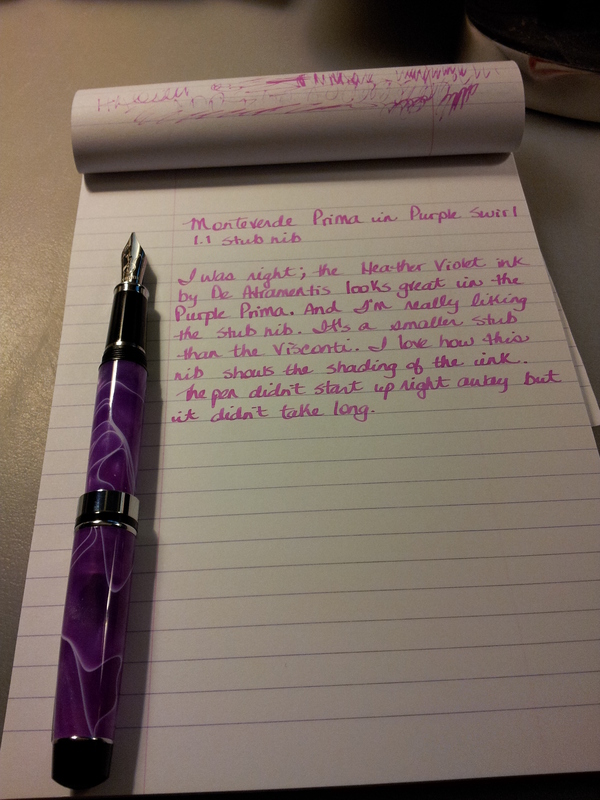 The picture makes the pen look more purple than pink, which is misleading, because the pen definitely looks pink in real life, albeit a deep, dark pink. It’s more of a fuscia than a purple but that’s my opinion. Whatever colour she is, she’s beautiful and I love her. 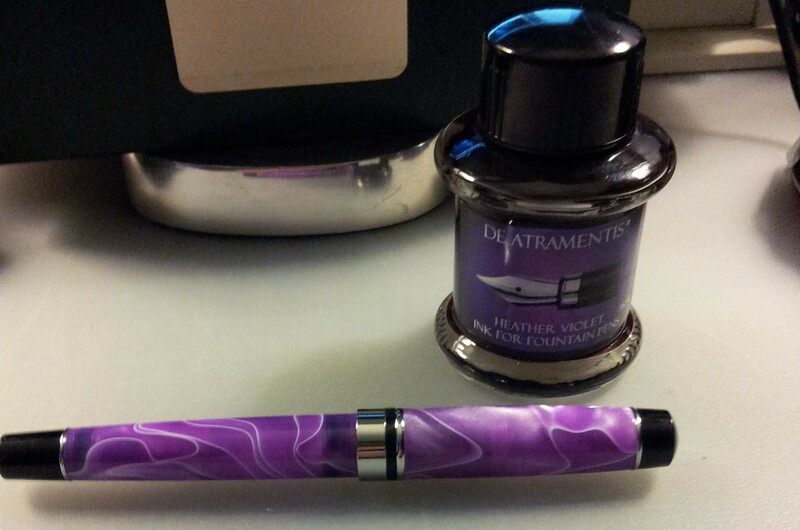 I’m a fan of matching the ink to the barrel colour so I thought the De Atramentis Heather Violet would do the trick. The pen comes with a glass converter. Here’s a closeup of that incredible nib. It has 1.1 stamped on the side turned away from the camera. I ordered a special nib for this one – 1.1 stub – which is a first for me, and I LOVE it. I love how it makes my handwriting appear more elegant somehow. Very smooth writer. The ink didn’t start up right away but it only took a few shakes. I really enjoy how this nib shows the shading of the ink. Trust me: in real life the ink is the EXACT same colour as the barrel but this photo doesn’t illustrate that. Very happy with this pen. This is a bit blurry but I wanted a photo of my two Primas together. You can really see the detail on the barrel. There are five Primas in the collection: Turquoise, Purple, Green, Tiger Eye (Brown) and Black. I have the Green and the Tiger Eye in my sights next; I don’t think I will buy the Black because it is really different than the other two and I don’t find the design appealing. It’s essentially black with a green line running through it. You can see them here. So that’s it from Wonderpens this time around. Many thanks to Liz and John for their excellent customer service. Can’t wait to have a big payday from World Mail Panel again….should be around November. Nice haul! 🙂 im curious about the Leuchtturm notebooks. Are they as fountain pen friendly as the Paperblanks journals?